OPPO officially launched the new F11 and F11 Pro in a start-studded event at the World Trade Center in Pasay City. Learn how OPPO's latest smartphone can keep up with these Pinoy influencers in the creative industry - to day work til night life. And why we should get one as well. Successful establishing the F series as the selfie expert, the F11 series showcases the upgrade from selfies to brilliant portraits by featuring a 48MP image sensor. This innovation will provide users with an unprecedented night photography experience. Software and hardware upgrades combine to improve battery life, gaming performance, and user experience. In addition, the F11 Series: Issa Pressman, Laureen Uy, Marga Bermudez, Rosenthal Tee, Luke Landrigan, and Magic Liwanag. Selected with utmost criteria, these individuals unique stories embody what the F11 Series stands for: the ability to shine in the dark, no matter the circumstances. 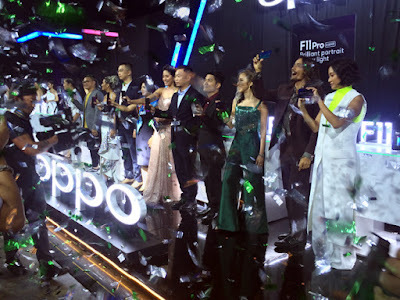 "With every launch, OPPO ensures that we put to heart the needs of Filipino market. Every innovation is made to uplift the consumer experience and that is what we made with the F11 Series. Through the shift in focus from selfie expert to brilliant portraits, we provide our users the opportunity to shine in the dark, to tell their untold stories through stunning portraits, and ultimately inspire others. That is what OPPO is all about," shared Jane Wan. Vice President of Marketing for OPPO Philippines. OPPO has worked for years to advance the field of the selfie photography, and through the F11 series has taken the next step to propel users to capturing brilliant portraits. The F11 series is equipped with a 48MP image sensor and F1.79 large aperture together with a 6P lens, the camera can sense more light when shooting in low light conditions, ensuring more details are captured. When capturing a night portrait, the included Tetracell technology analyzes and combines data from four adjacent pixels to achieve the equivalent of a single 1.6µm pixel. Twice the number of photosensitive pixels improves light sensitivity and allow users to capture clearer night portraits. The F11 series also employs Ultra Night Mode and Dazzle Color Mode technologies. These technologies leverage Al and multi-frame noise reduction to achieve less noise, handheld stabilization, highlight suppression, and enhanced dynamic range. These all combine to enable users to capture levels of brightness and detail that normally exceed the limits of the human eye. When capturing a night portrait, the F11 series automatically distinguishes between a human face and the background, ensuring the human is the focus of the scene. The F11 series not only captures excellent portraits with its rear camera, but also continues the "Selfie Expert" tradition of the F-series. Selfies taken with the F11 series are as natural and beautiful as ever. OPPO advocates an aesthetic of "natural creation" and has captured the beauty of nature in the F11 Pro via breakthrough in both materials and workmanship. OPPO is also the first smartphone manufacturer to create the first triple-color gradient design, Thunder Black. This unique design blends red and blue in to classic black, akin to a meteor streaking across the night sky. OPPO also created a unique double color gradient design, Aurora Green, which draws inspiration from vibrant blue oceans interwoven with lush green continents. The F11 Pro comes equipped with a 6.5-inch full HD+ screen, featuring an aspect ratio 19.5:9 and a screen-to-body ratio 90.0%. In particular, the F11 Pro features a hidden front camera module to free up space for its full screen display. The motor on the front camera modules has been thoroughly tested to ensure it can operate 100 times usage per day for 6 years without fail, thus ensuring a positive user experience. The F11 series features a much more elaborate design, retaining the experience-optimized crescent design from the previous generation, but also adding a transparent, amber-colored hidden camera module. When the camera rises up, users are treated to stunning visual experience. The F11 series also succeeds in upgrading the overall user experience. First, the F11 series comes equipped with a 4,000mAh battery which is 500 mAh higher than the previous F series smartphone. The brand new VOOC 3.0 flash charging technology is further improved to shorten charging time by 20 minutes. This means the F11 series can be charged within 80 minutes. Now, VOOC has over 90,000,000 users around the world. The F11 series also reduces power consumption through optimized hardware and software technology. The F11 series contains low-power MTK P70 CPU and ram-equipped display. Through this, the F11 series achieves a long battery life via faster charging technology, a larger-capacity battery, and lower power consumption. With regards to gaming, OPPO has independently developed its own performance acceleration engine called Hyper Boost, optimized for 11 popular mobile games, including PUBG and AOV. By optimizing the system resource mobilization plan, hardware resources can be utilized more effectively, resulting in faster game response, no disconnections, and no dropped frames. Meanwhile, OPPO has introduced two useful tools - Game Space and Game Assistant, providing gamers with a more immersive gaming experience. The OPPO F11 Pro is also equipped with the new ColorOS 6 system, specially designed for full-screen smartphones. The innovative borderless design further increases ease of use. In addition, ColorOS 6 has multiple functions, including OPPO Cloud Services, Smart Assistant, and Gesture Navigation, allowing users to experience a smarter lifestyle. Pre-order your own OPPO F11 Pro! With the OPPO F11 Pro's features, it surely is irresistible given its great price of P18,990. Pre-orders starts on March 28 with a free rock space MUSE Bluetooth speaker which is worth P2,499 It will be available for claiming at all OPPO stores and authorized dealers nationwide starting April 6, and it comes with a free screen warranty if claimed within the day. We're making it even more accessible through Home Credit, where customers can pre-order the F11 Pro at 0% interest, with 9 months and 12 months to pay. Customers can also avail the product with no cash-out, at 0% interest and 12 months to pay with BDO and Metrobank as well. The OPPO F11 Pro will also be available under Globe via Plan 1499 with no cash out, and Smart exclusive Plan 1099.